Sloopin - A South Loop Blog: More Cupcakes Hits Michigan Ave. Walking home today (3/31), just on the corner of 13th and Michigan right outside of Sky Grocer, I saw this truck selling cupcakes. "Forever More Cupcakes." First of all, I can't resist cool packaging. They came in Chinese takeout boxes with labels that said "more." I bought a couple, just for the uniqueness of buying cupcakes out of a truck. They were about $3.50 each. 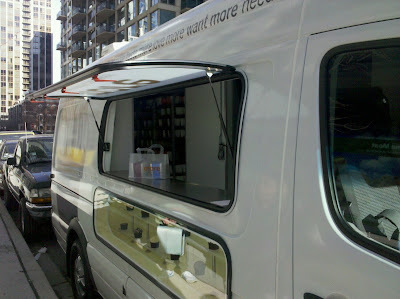 The truck was very sleek looking, and there was a display window below the counter of all of the cupcake flavors. We got a Red Velvet and a Chocolate Hazelnut and they were exceptional!! We did some more research and am pretty sure that it's a van from More Cupcakes which is located in the gold coast and State and Delaware. We found this pic on twitter and it seems to mirror the one our reader sent. Looks delicious! I stopped by and picked up a salted caramel and chocolate hazelnut as well. Yummy, but for me not worth the cost. I do hope we start seeing more food trucks in the neighborhood. Be great if Chicago would let them actually cook on them. There are a few trucks circling the city now. Flirty cupcakes was the first truck to hit the streets and is my favorite out of all. They are in the South Loop weekly, usually on 13th and Michigan and Printer's Row.